Kalamazoo, MI: The Kalamazoo Department of Public Safety (KDPS) is proud to announce a redesign of its website at www.kalamazoopublicsafety.org. The redesign, which was completed in-house, includes updated department information, new graphics, and a new crime mapping system. The new design simplifies the menu structure, allowing users to more easily find the information they need. It also has more integration with social media, it loads faster, and it uses responsive design, allowing the new website to work better on mobile devices. Citizens are encouraged to continue using the Coplogic “Report a Crime” tool to report certain non-emergency crimes that occurred within the City of Kalamazoo. KDPS has partnered with the Omega Group and Trimble Public Safety to bring Kalamazoo crime statistics and crime alert notifications to www.crimemapping.com. The new system uses a user-friendly mapping interface and expands the list of online-reported crimes to include simple assaults, public disturbances, destruction of property, drunk driving, and weapon violations, which were not previously reported online. The new crime mapping site receives data from the KDPS police records management system once a day and displays anonymized location, time and date, case number, and crime type for selected crime types. It is the same public, crime-mapping solution used by the cities of Grand Rapids, Lansing, Flint, Detroit, and Ann Arbor, among many others. CrimeMapping.com also has an iOS app to show crime data on your mobile device. Users who subscribed to the previous crime alerts will need to resubscribe on the new crime mapping website. The new website and online crime mapping system are about half as expensive to operate as the legacy systems they replaced. Kalamazoo, MI: The Kalamazoo Department of Public Safety’s 14 newest public safety officers began their six-week KDPS advanced academy training today. They will be instructed on a variety of topics with the bulk of this week focusing on Cultural Awareness. 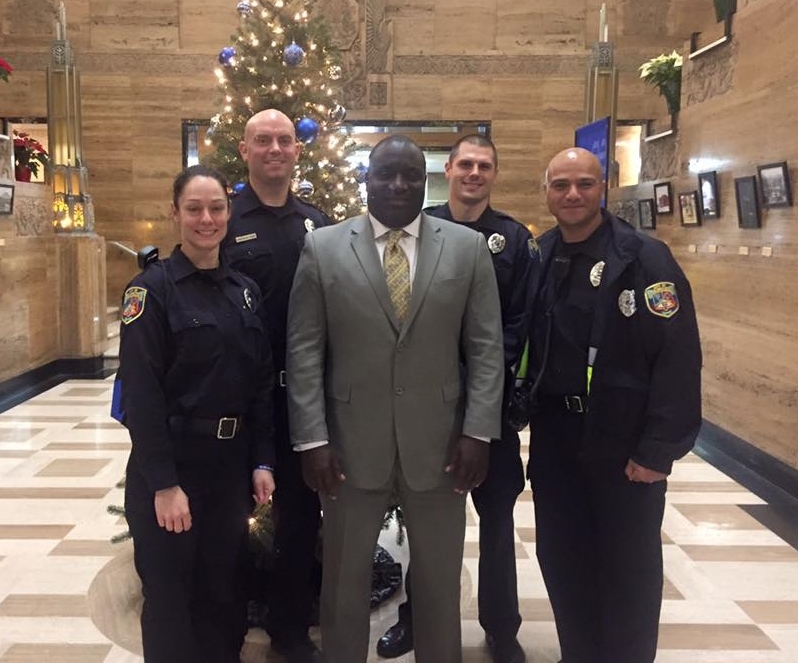 As a new and creative approach to learning about the City of Kalamazoo and to meet citizens they will be protecting and serving, they were assigned to do a scavenger hunt that has them going to various organizations, businesses, and locations. They are currently on the scavenger hunt, and will be about town introducing themselves until approximately 3 p.m. The goals are to make them comfortable with proactive community engagement, to foster building positive relationships and networking, to obtain information so they can become referral sources, and to engage in working in teams. You can follow their journeys on the Kalamazoo Department of Public Safety Facebook page: https://www.facebook.com/KalamazooPublicSafety/. Kalamazoo, MI: On Sunday, December 13th, 2015, at approximately 3:53 a.m., Kalamazoo Public Safety officers responded to the 800 block of Woodbury Avenue on a report of multiple gunshots fired. Upon arrival, officers found a 33 year-old male with a gunshot wound to the chest. The victim was transported to Bronson Hospital for medical treatment and is listed in stable condition. Detectives are currently investigating the case. Kalamazoo, MI: On 12-09-15 at approximately 8:15 pm Kalamazoo Public Safety responded to the area of Ada and Woodbury in reference to the victim of a Larceny from Vehicle following the suspects’ car to this location. Once in the area of Woodbury and Ada one of the passengers of the suspect vehicle got out of the car, and the victim continued to follow the suspect car. Pso Brian Veltman was arriving in the area at this time, and was approaching the intersection of Simpson and Ada. Pso Veltman then observed the passenger who had exited the suspect car firing a handgun at the victim’s car in the intersection. Pso Veltman attempted contact with the suspect but he fled on foot, and was apprehended in the 600 Block of W. North by Pso Veltman and Pso Reiber. The handgun was located a short distance away from the suspect as he had discarded it during the foot pursuit. The suspect was identified as a 27 year old male Kalamazoo resident. He was arrested on the charges of Assault with Intent, Resisting and Obstructing, Felony Firearm and Felon in Possession of a Firearm. He was lodged at the Kalamazoo County Jail pending review by the Prosecutors office. The suspect vehicle fled the scene, and was not located. Public Safety is requesting anyone with information about this crime to contact the Kalamazoo Department of Public Safety at 337-8994, the Criminal Investigation Division at 337-8139, or Silent Observer at 343-2100 or www.kalamazoosilentobserver.com. 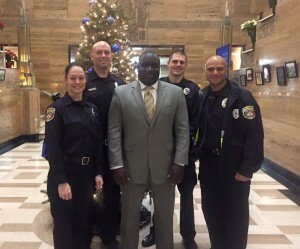 Kalamazoo, MI: On Monday December 7th, 2015, at approximately 7:21 p.m., Kalamazoo Public Safety officers responded to the 500 block of Florence Street on a report of a shooting. Upon arrival, officers found a 21 year-old male with a gunshot wound to the arm. The victim was transported to Bronson Hospital for medical treatment. The injuries are non-life threatening. There are no suspects and it is not clear what events preceded the shooting. Kalamazoo Public Safety officers continue to investigate.